The report, “The use of cash by households in the euro area”, written by Henk Esselink and Lola Hernández, presents the results of the study, including an estimation of the number and value of payments made with cash and cards by consumers in the euro area. The study also assesses the use of each payment instrument by consumers at the country level. The survey results show that in 2016 cash was the dominant payment instrument at POS: 79% of all transactions were carried out using cash, amounting to 54% of the total value of all payments. Cards were the second most frequently used payment instrument at POS: 19% of all transactions were settled using a payment card. In terms of value, this amounts to 39% of the total value paid at POS. The use of cash and cards differs according to country, place of purchase, transaction value and consumers’ demographic characteristics. 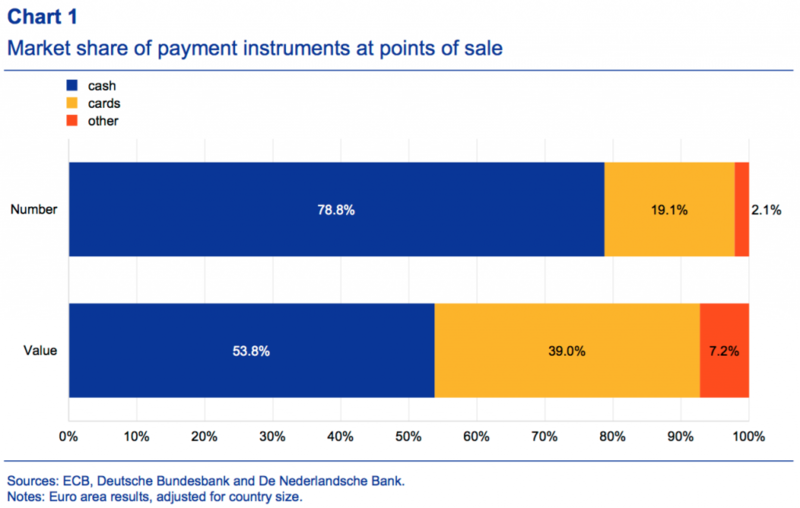 In terms of number of transactions, cash was most used in the southern euro area countries, as well as in Germany, Austria and Slovenia, where 80% or more of POS transactions were conducted with cash. Cash was least used in the Netherlands, Estonia and Finland, where its share in the number of transactions ranged between 45% and 54%. In terms of value, the share of cash was highest in Greece, Cyprus and Malta (above 70%), while it was lowest in the Benelux countries, Estonia, France and Finland (at, or below, 33%). Overall, the results put the use of cash relative to non-cash payment methods by consumers at POS into perspective, and indicate that the use of cash at POS is still widespread in most euro area countries. This seems to challenge the perception that cash is rapidly being replaced by cashless means of payment. Indeed, as the results of this study show, when consumers are asked which means of payment they prefer, a larger share report to prefer cards rather than cash – despite the fact that they use cash more often. This contradiction may be explained by the fact that nearly two-thirds of the transactions conducted at POS in 2016 were below €15. Moreover, two-thirds of all POS transactions took place in shops for purchases of day-to-day items, as well as in restaurants, bars and cafés. On the other hand, only 8% of all POS transactions were above €50, and only 14% were made in shops for durable goods or in petrol stations. When asked about their payment behaviour, people mostly seem to remember the larger value payments which they make less regularly, and tend to forget how frequently they make low-value payments on a daily basis. Access to payment cards does not seem to fully explain differences in payment behaviour, because on average access is high in all euro area countries. However, there seems to be a relationship between card acceptance (i.e. the perceived availability of card payment terminals) and cash usage. It can therefore be expected that in countries and market sectors where card acceptance is still low, cash usage may decrease once infrastructure for making card payments becomes more widely available. Since contactless payments are typically relatively low value and 81% of all payments at POS are below €25, this could have a significant impact on the use of cash for smaller value payments, especially given that respondents who prefer cash and those who prefer cards both appear to place importance on the transaction speed of their preferred means of payment. The study confirms that cash is not only used as a means of payment, but also as a store of value, with almost a quarter of consumers keeping some cash at home as a precautionary reserve. It also shows that more people than often thought use high denomination banknotes; almost 20% of respondents reported having a €200 or €500 banknote in their possession in the year before the survey was carried out.